One of my favourite parts of my job is helping women get to the root problem. I love the art of peeling back all the layers and finding the exact thing that isn’t working perfectly in the human body. It takes digging and I often feel more like a detective than a nutritionist but it makes my soul happy to find the root cause of my clients issues. Part of how I do the digging is by using hormone tests. I always tell my clients, test don’t guess because the reality is one symptom can mean 100 different things and you can waste a lot of time and money going down the rabbit hole and trying everything out. Whether you’re struggling with thyroid issues like hashimotos, hypothyroidism, or subclinical hypothyroidism. If you are dealing with weight issues that you can’t get a handle on. If you can’t get out of bed in the morning and your exhausted all day then can’t fall asleep in the evening. If you have brutal PMS that keeps you in bed all day or having to miss work or school. If you have or suspect you have PCOS and don’t know what to do now. All of these concerns may be helped by getting a full hormone panel done and finding the root cause. Not all hormone tests are created equally, read on to find out which test is the cream of the crop and which one is just a waste of time. With the majority of my clients I run a complete hormone panel on them. This shows how your hormones are functioning in your body. It looks at when specific hormones are released and how they are used in the body. The test looks at the different hormones’ pathways and what pathways your hormones are taking. Why is this important? This shows if your hormones are acting dangerously in your body, aka if they are taking the pathway that is more likely to contribute to cancer risk. This hormone test is also important because it can show whether or not PCOS (polycystic ovarian syndrome) is a risk for you. 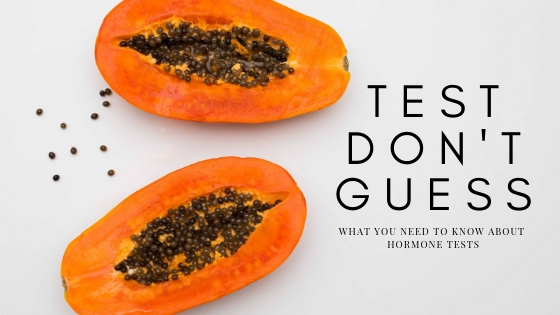 If you’ve already been diagnosed with something like PCOS, a complete hormone test will show you exactly how your hormones are functioning so that your protocol and action plan can be formulated just for you. Blood Tests: these tests are often run by your medical doctor. Blood Tests: this test is simply a snapshot in time. With blood testing you don’t see how the hormones are functioning in your body. Hormones are chemical messengers transported to target tissues via the blood, so testing hormones from a blood test is not going to yield information about bioavailability or pathways being used by the hormones in question. Blood tests or Serum Tests are widely accepted as the preferred hormone test by conventional doctors. Saliva Tests: is fairly non- invasive. This means that the results are relatively accurate compared to blood tests where cortisol is likely to be elevated due to the nature of the blood test. One positive of saliva tests is that you can collect many samples in one day to see the patterns of your hormones rather than blood testing which is just a single snapshot in time. Unfortunately, when it comes to saliva testing it can easily be skewed by different medications, including HRT (hormone replacement therapy), which will give you false results. It also is a difficult test to get your doctor to perform, because blood is much more recognized. Urine Tests: this is the gold standard in terms of hormone tests. Why? Because you get to see patterns in the hormones, aka, you can see if your stress hormone called cortisol rises and falls at the correct times of the day and see if the slope is correct. With urine tests you also see the metabolites of your hormones. Metabolites are how your hormones your metabolized in your body. This provides a picture of the entire family of a hormone instead of just the main hormones. It’s like if you draw a family tree and you draw your parents but you don’t include yourself, your siblings, your aunts, uncles, cousins, and the rest of your family. You simply are missing the rest of the family and therefore you don’t get the see the entire picture of your family. I love using urine tests in practice because it provides you the full 360º view of exactly what’s happening in your body when it comes to your hormones. Hormone testing is useful for everyone. I would highly recommend booking a free call with me and we’ll walk through what issues and concerns you are currently struggling with. This call will help you understand if hormone tests are something I would recommend for you. To book your free call, head here.